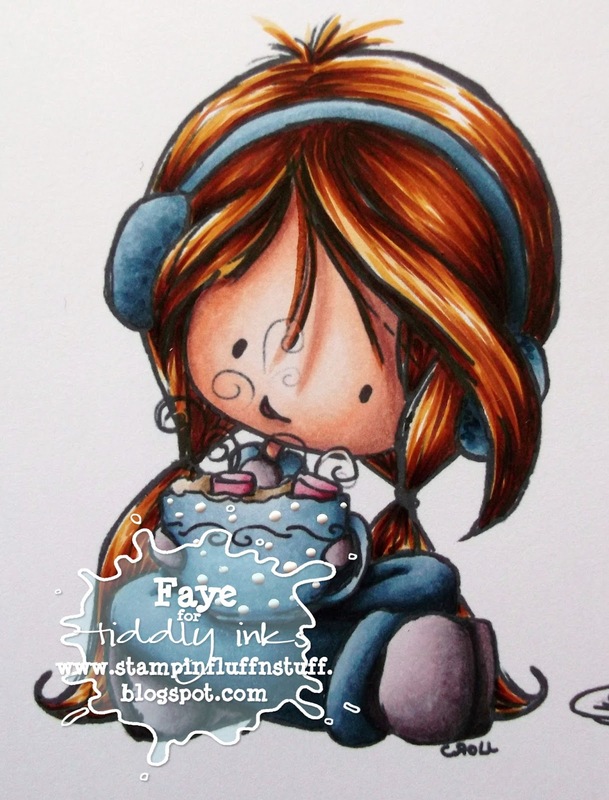 Today sees the start of a new Challenge over at Tiddly Inks... Winter Blues. We would like to see something wintery with a touch of blue in it. Time to get my favourite Echo Park Papers out, the ones I reserve for stroking only. But, they are perfect for Cocoa Wishes, don't you think? Talking of Hot Choklit, that's a flippin' good idea... Yum! Love the hair combo must write that done ..
Gorgeous! I could say more, but then I'd simply be repeating myself. Gor-geous! So sweet! I adore her polka dot mug! Kraft and blue my favourite colour combo. This is adorable. Goooorgeous card!! Love, love, love how you colored this image!! That hair ... wow! Fab!! Hope youv'e had your fill of hot chocklit. BTW. blogger is having a fit again and has decided to add word verification to all our blogs regardless of what our settings are. It you switch to embedded it will take if off again. hugs muver. I'm defo not a robot. I currently have a nice hot coffee in my hand rather than a hot chocolate but it's still good! Great addition of the sequins too! You took a guillotine to that FABULOUS paper?? You terror you!! But ignoring the above... WHAT a gorgeous card with such (only to be expected) beautiful colouring!! Love her hair and the well coordinated color scheme. The sequins are great details! Love this card Faye, your coloring is amazing and the papers are so pretty. Stunning card. I so love the kraft agains the white. And the coloring is beautiful. Fabulous card faye and stunning colouring as always. Hi Faye! Just the type of card for today, lots of hot choc as its cold, wet and windy :( I LOVE her hair... in awe as always! Mwah!!! This is stunning! Such a beautiful card with gorgeous colours. The image looks fab too - I love her hot chocolate! I love that hair too..great card! Brilliant colouring Faye, it's a fabby card sweetie.